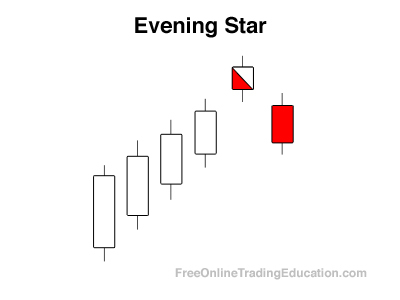 An Evening Star is a three candlestick bearish candlestick pattern that occurs after an up leg and starts out with an up bar with a large real body. The second candle has a narrow range and gaps up on the open. The last bar opens with a gap down and then closes as a bearish candlestick below the midpoint of the body of the first bar. 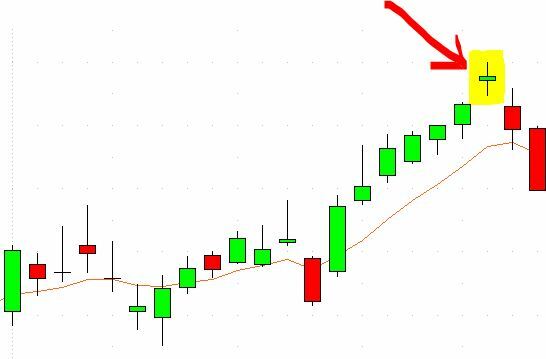 Technical analysts will often use the Evening Star Candlestick pattern as a bearish signal for selling opportunities. Additional confirmation in the form of a bearish trade setup is typically necessary before the trader will sell into a position.